A friend suggested I show what I eat in a day on my blog. She suggested I take pictures of my meals, explain why I choose different foods, and ways I like to prepare them. So I’ll give that a shot and tell you what I ate yesterday! I like to start my morning flushing my system out with some water and/or tea. I start drinking water as soon as I get up and throughout my morning routine. This morning, I added some fresh ginger and lemon juice to my first glass of water. I usually get my day started with some kind of protein. I don’t tolerate too many carbs, and I’m not vegan or vegetarian, and eggs make me feel good. I had one hard boiled (free range) egg before I left the house. I usually try to mix in some vegetables with the eggs – such as spinach – but did not have time for this yesterday. I also like to add fruit in the morning. 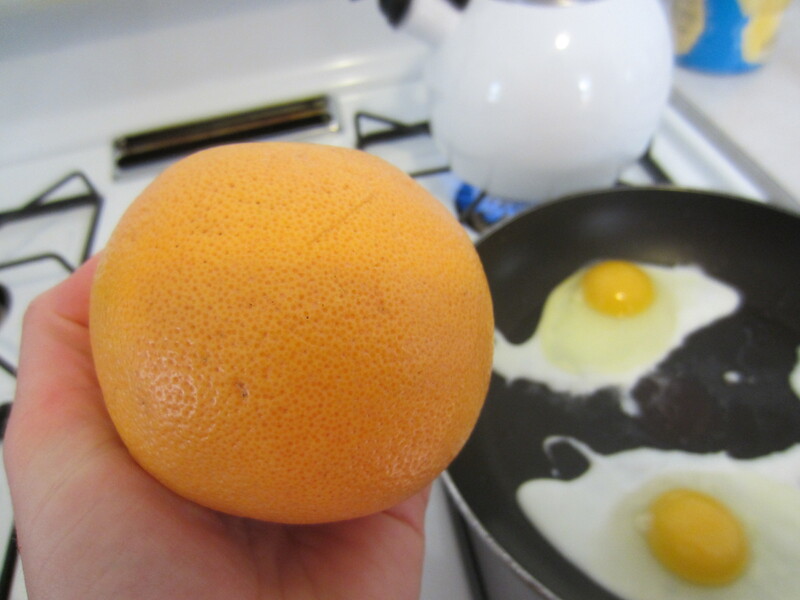 Sometimes I fry my egg with a little coconut oil – as seen in this picture. I like my eggs not fully cooked – soft boiled or over-medium. I didn’t plan accordingly and pack a mid-morning snack for work yesterday. Usually I pack some nuts and dried fruit or an organic protein/vitamin drink. So at work, when our new computer system was getting to me and I was ready for a break, I grabbed a breakfast burrito and a coffee. I am lucky to work for a hospital who is really trying to ensure high quality healthy foods are sold. Now they aren’t perfect (cookies, donuts, cake, or pizza is usually featured at employee functions) but do a great job at offering local and organic snacks and meals – and even hold a farmer’s market on-site every other week! I chose the breakfast burrito because it was made with free range local eggs, organic cheese, and the chorizo was from a local farmer. I don’t usually have eggs twice in the morning, but the burrito really sounded great. I choose tortilla as opposed to bread or a bagel since there is less gluten and I limit my gluten intake. I have come to the conclusion that coffee is fine in moderation, and best when organic and black. Coffee has antioxidants after all, it just that calcium from cream will block the absorption of them – so if you are drinking it black, you are getting antioxidants. I usually drink about one and half liters of water while at work. I bring in my own water since we have a reverse osmosis filter at home – I’ll save more on that for a future blog. Since I ate the breakfast burrito at 1030, I didn’t end up eating my self-made lunch until after two. Lunch consisted of mixed greens (kale, spinach, and swiss chard) I had obtained from the farmer’s market in my area (which I tossed with some olive oil, lemon juice, and sea salt) and an apple. Now I have to admit, a salad and fruit isn’t always enough to fill me up. Sometimes I get a grass fed burger from the cafeteria to go along with my greens. Yesterday, what I brought for lunch was enough to satisfy me. 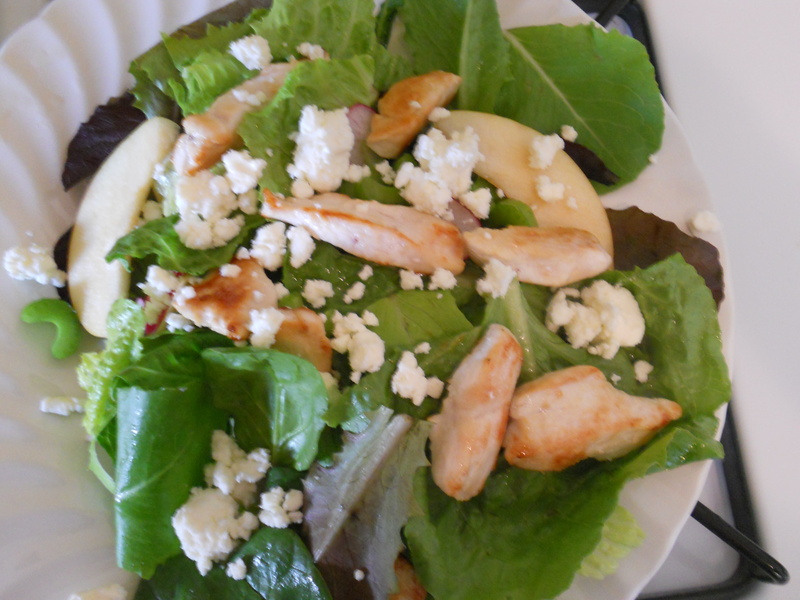 Sometimes I will add chicken to my salad to help fill me up – something like the salad shown below which I had for lunch the other day. 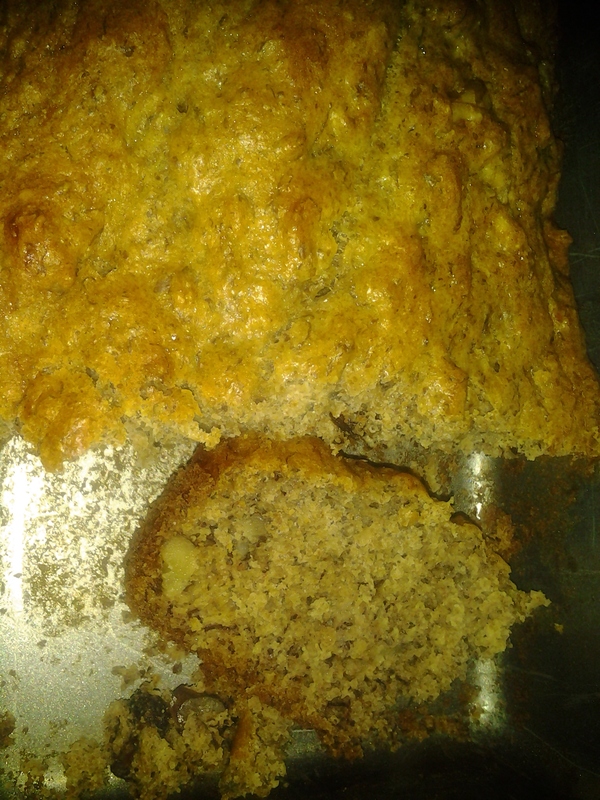 When I got home from work, I made some banana bread. Now banana bread isn’t necessarily healthy, but I use a somewhat healthy recipe: organic spelt flour, coconut oil, flax seeds, hardly any sugar, and usually some healthy nuts and/or raisins. This was my before dinner snack along with some organic non-homogenized milk. 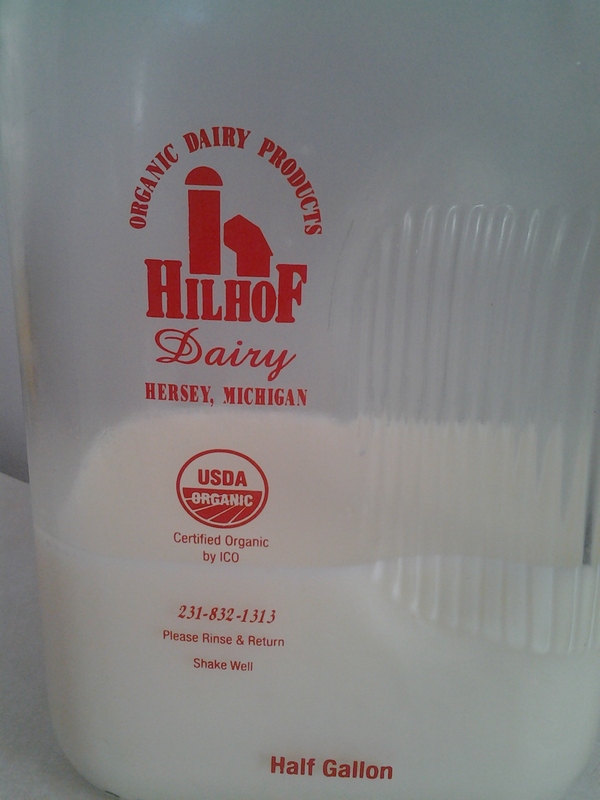 I would prefer to drink raw milk, however, it is illegal to sell it in stores in Michigan and must be bought directly from a farmer. Homogenizing milk changes the molecular structure, making it harder for your body to absorb nutrients. We then went for a bike ride before dinner for our daily exercise. Today will be Zumba and tomorrow is African dance – mixing up my exercise routine (and any kind of dance!) keeps me motivated. Food is usually healthiest for you in its raw form, and I have been experimenting with raw recipes lately. Below was our dinner last night. It is sort of like a raw version of lasagna. 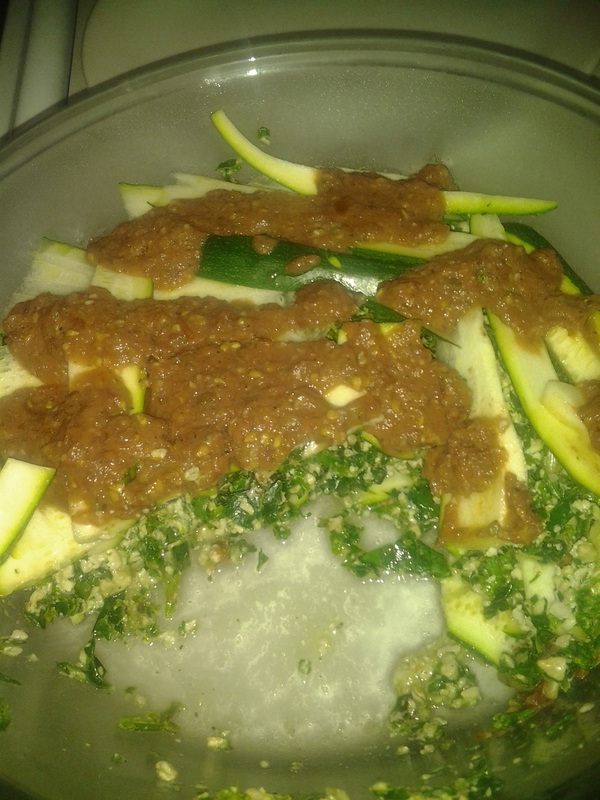 The zucchini is like the noodles, with a filling of spinach/kale/swiss chard mixed with sunflower seeds and lemon juice. The dish is topped with more zucchini slices and then raw tomato sauce – tomatoes blended with olive oil, garlic, and herbs. 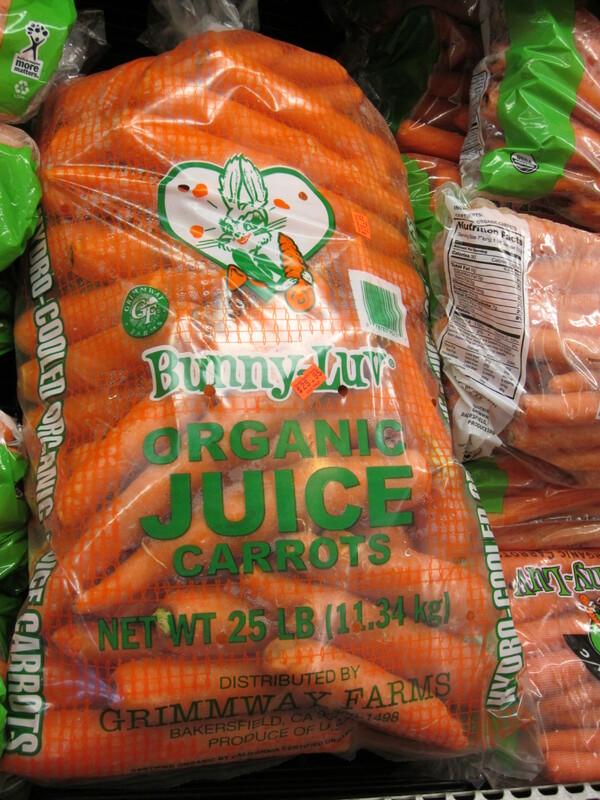 I like to do some juicing almost every day and will discuss the benefits of juicing at a later time. I did not do any juicing yesterday but will make sure I fit it in today! I have plenty of kale and carrots to use up. I do take supplements in addition to my diet – see my previous blog (Five Health Tips) where I discuss some supplements I recommend. I think everyone is different when it comes to their carb versus protein needs. I have found that eating too many carbs makes me feel sluggish and foggy so I am careful of the amount and type of carbs I eat. Everyone can benefit from eating vegetables and I would say the best way to start getting your diet on track is adding more veggies! Nobody’s diet will be perfect all the time, but make the best out of the choices available to you at the moment, think about where your food comes from, and remember it’s constantly a work in progress! This entry was posted in Nutrition and tagged farmer, flax, ginger, juicing, local, market, meals, organic, raw, vegetables by Tina's Pharm. Bookmark the permalink. Thank you Aunt Linda! 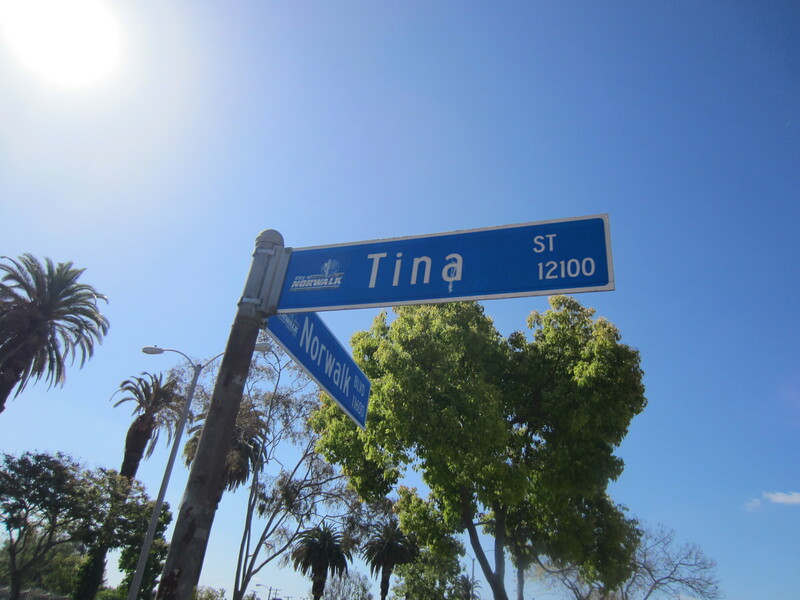 =) I will have to come visit sometime soon – it’s been too long!